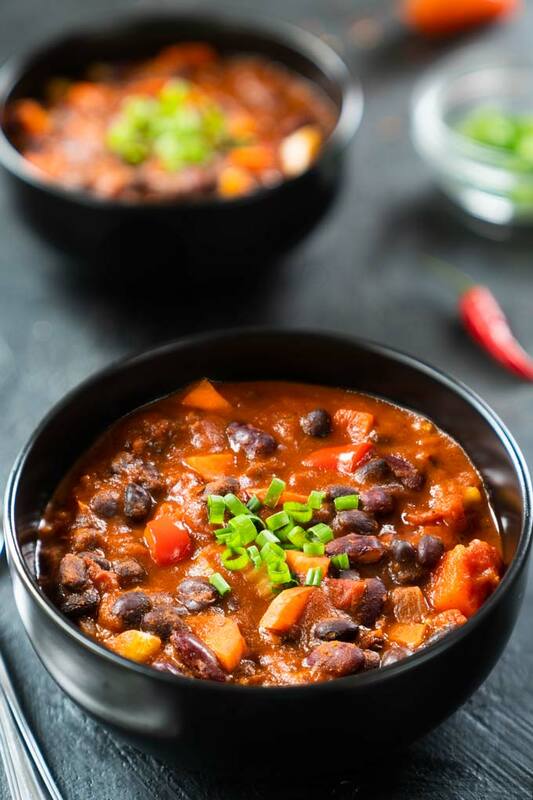 This vegan chili made with dried beans, fresh chili peppers, and fire-roasted tomatoes is my personal favorite. 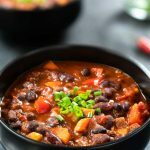 While I’ve made an insane number of different vegan chili recipes over the years, I keep coming back to this one. 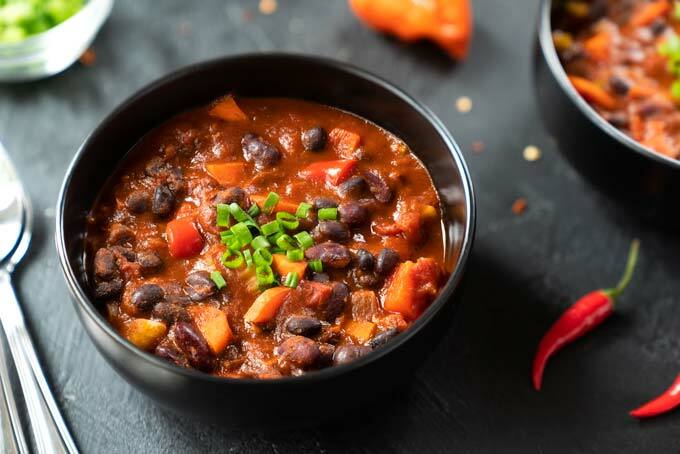 With its rich, complex flavor that combines sweet, hot, and fruity elements in balance, it’s the best vegan chili I’ve ever had: hearty, filling, and so satisfying. I like to serve it with a side of tender cornbread and a dollop of vegan sour cream. I’m a European while my husband (Tanner) is a Canadian. There’re many subjects we have different opinions on, but the culture around food is the one that comes up most frequently. I only buy food I know I’ll eat in the next few days. Tanner buys things in bulk. I love fresh food, so I only cook the amount I’ll be eating on the day of cooking. Tanner batch cooks and loves to have leftovers for the next few days. I consider pasta mixed together with vegetables a complete meal. For Tanner, it’s two sides thrown together with the main meal component (aka protein) missing. I don’t like throwing food away. Tanner thinks that it’s better to throw away a few things rather than having to drive to the store any time he needs something. I prefer cooking meals entirely from scratch, using fresh vegetables, dry legumes, homemade stocks, even if it takes hours to prepare. Tanner prefers frozen meals he can have on the table in a few minutes. We can have our pantry stocked with wholesome ingredients, but as soon as the freezer is empty, he feels there’s nothing to eat. I prefer to taste the real flavor of foods. If I think my food tastes a little bland, I use herbs. Tanner loves spicy food that literally burns your mouth. He puts hot sauce into everything! What’s all that got to do with chili? Well, it’s just not all that popular where I come from, but it’s very popular in Tanner’s family. In fact, I had never tasted chili before I met Tanner. The first family event Tanner ever took me to was a chili cook-off where everybody prepared their own particular recipe and shared it with everyone. That’s where I learned that chili is a very personal thing, and everybody has their favorite recipe. This vegan chili isn’t trying to imitate a meaty chili. Instead, it celebrates vegetables and legumes. It’s not the quickest and easiest recipes either. Sure, you can make your chili with some commercial pre-mixed chili powder, a can of beans, and some pureed tomatoes thrown together in a slow cooker. But is the flavor going to blow your mind? Not likely. Throwing some pre-mixed chili powder from the store into a slow cooker is fine for a quick weeknight meal. However, perfect chili needs the complexity and richness you can only get from toasting and pureeing fresh chili peppers or grinding dried chilies into a powder. There are many varieties of chili peppers, depending on the region they come from. I like to make my chili powder from a combination of sweet, hot, smoky, and fruity chili peppers. Yes, I always mix and match at least four different chili peppers. Making your own chili powder (or puree) is what makes any chili more art than science. And then there are beans. While I understand that canned beans are much more convenient, I don’t mind taking the time to soak and cook dried beans from scratch for just about any recipe. Dried beans have a more complex flavor, creamier texture, deeper color, and a better nutritional profile. If you’re intimidated by the whole cooking dried beans from scratch thing, don’t be! It’s much easier than you think. As far as bean variety goes, I like to use two different kinds of beans for textural diversity. Kidney beans and black turtle beans are my favorite, but any legumes work. If you’re a Texan, you probably don’t use tomatoes (or beans) in your chili, but I do. You can’t beat the sweet taste of fresh homegrown tomatoes – whether you use them directly in your chili or in fresh salsa. If you do go for canned tomatoes, use whole rather than diced. Canned diced tomatoes contain calcium chloride (a firming agent), which prevents the diced tomatoes from softening and breaking down. Canned whole tomatoes yield a more natural texture. Every good chili starts with vegetables. Onions, garlic, fresh chili peppers, celery, red bell peppers … Sauté all the vegetables before you add any liquid to draw out as much flavor as possible. The same goes for the seasonings. Don’t wait till the very end to add them because you’d be missing out on a lot of flavor. Sauté the spices and herbs together with the vegetables so the flavors mingle and develop a rich taste. When your spices are fragrant and toasted, add soy sauce to create the elusive fifth taste. For chili exploding with richness and layers of flavor, you need to cook it low and slow. You don’t have to worry about the vegetables and beans softening and turning into a mush. The chili base – chili peppers and tomatoes – is acidic and vegetables and beans soften very slowly in acid. Going back and forth between covered and uncovered cooking will keep the chili from becoming too watery or too thick. If your chili starts turning too thick, you can always add some homemade vegetable broth. If your chili isn’t thick enough, lightly mash the beans and vegetables with a potato masher to release their natural starches. Hearty, filling, satisfying, and packed full of vegetables. Add the soaked beans into a medium saucepan. Cover them with water and bring it to a boil. Remove any foam that forms. Reduce the heat to a bare simmer and cook the beans until tender. The time will vary depending on your own beans, but you are looking at approximately 45 minutes. Place the tomatoes cut side up on a baking sheet. Add a little bit of olive oil and salt, and toss the tomatoes around until evenly coated. Roast the tomatoes at 400°F/205°C until slightly charred, about 25 minutes. Heat the oil in a large saucepan. Add the onion and garlic and saute the aromatics until translucent, about 6-8 minutes. Add the jalapeno peppers and chili powder and saute until fragrant, about 2 minutes. Add the celery and red bell pepper and continue stirring until softened. Chop up the roasted tomatoes and add them to the saucepan together with their juices. Add the cooked beans, a little bit of the bean-cooking liquid (or vegetable broth), and tomato paste. Stir and season with salt. Let the chili simmer for 2-3 hours. If the chili becomes too thick, add some more vegetable broth. If it's too thin, add more tomato paste or mash some beans and vegetables to help the chili thicken up. Serve immediately, or for best flavor, allow to cool and refrigerate overnight. Reheat, and serve with desired garnishes. Store leftover chili covered in the refrigerator for 3-4 days. For longer term storage, freeze in an airtight container for up to 3 months. 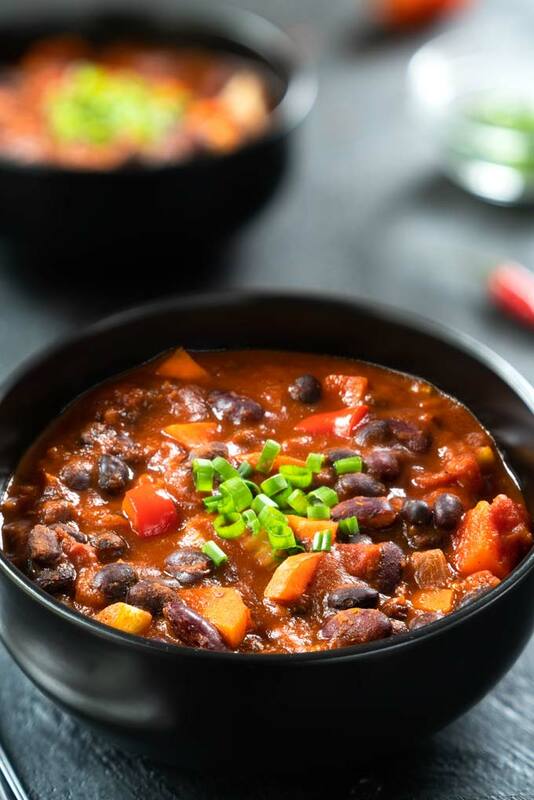 The easiest way to reheat the chili is to remove it from the freezer 24 hours before reheating and place it in the refrigerator to thaw slightly. Reheat on a stovetop, adding extra 1/4 cup vegetable broth to prevent it from scorching. Stir regularly as the chili heats up. Clean the chili peppers: use a pair of kitchen scissors to cut the stem away and then shake or scrape the seeds from the inside of each pepper. Cut the peppers into smaller pieces before adding them to the pan to toast. Toast the chilies and cumin in a medium cast iron skillet over medium-high heat. Move the pan around constantly, until you begin to smell the cumin, approximately 4-5 minutes. Set aside and cool completely. Once cool, process the chiles, cumin, oregano, and smoked paprika in a blender. Leave the lid in place until any dust settles so you do not get a cloud of ground chili peppers in your face. *3/4 cup dry black beans is equivalent to 1 (15 oz/425 g) can. *1/2 cup dry kidney beans is equivalent to 1 (15 oz/425 g) can. *1/2 cup dry pinto beans is equivalent to 1 (15 oz/425 g) can. *Soak the beans for at least 8 hours (or overnight). To quick-soak, pour boiling hot water over the beans and soak for 1 hour, uncovered. Drain, rinse, and use as instructed. **You can also use 1 (28 oz/794 g) can of fire-roasted tomatoes. ***If you're using dried beans, you can use the bean-cooking liquid instead of vegetable broth. ****The chili powder is on the spicier side, so add it in stages. If you use store-bought chili powder, 2 Tbsp./16 g should be fine. *****The prep time does not include soaking the dried beans (8 hours). Hi, could you please post the recipe for the cornbread? Thank you. Thank you for sharing this recipe, Petra! I have made many different chili recipes over the years, but this one is my favorite. 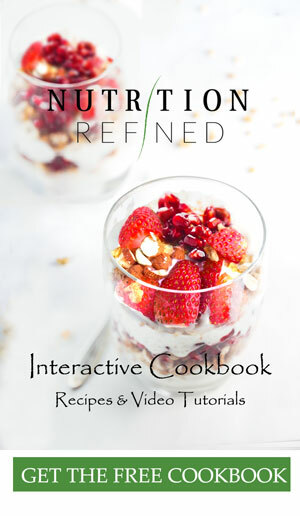 Keep sharing amazing recipes! So happy you enjoyed it, Pavla!❤️﻿ I appreciate your feedback! I am going to try this tomorrow. I always like to know how others cook their beans. I just love your recipes and the manner you present them. Hi Petra I made the chili and cornbread this morning. It came out great. Just a question. When I soak the beans over night, do I cover the beans and keep on counter or do I put them in the fridge? Hi Tina – if you’re soaking the beans just overnight, you can keep them on the counter. However, if it’s too hot in your house or you’re planning on soaking the beans longer than that, you might wanna put them in the refrigerator to avoid any fermentation taking place.